For advertisers, understanding how much to bid for each ad is tricky. Bid too little and your ad will not get displayed but bid too much and you risk blowing too much of your overall budget. 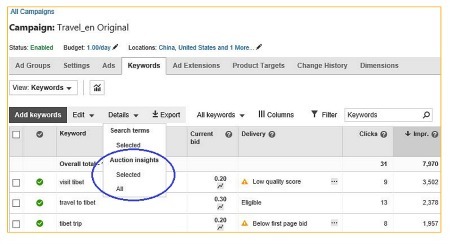 To help solve the problem Bing Ads has recently announced the availability of Auction Insights to marketers around the world. The feature, initially available to those in the U.S. only, shows advertisers how they are performing in comparison to other advertisers who are competing against them in the same auctions as they are. While this feature will not reveal the actual amount that competitors are bidding or the keywords they are using in their campaigns it will help advertisers to understand who they are competing against. Advertisers can access the feature through the Campaigns page by clicking the “Details” drop-down menu then either “all” or “Selected” under the ‘Auction insights” section.